Religious leaders come together in D.C. to take on racism, finish work of Martin Luther King, Jr.
On the 50th anniversary of the assassination of the Rev. Dr. Martin Luther King Jr., thousands of marchers from several religious communities came together to rally against racism in Washington, D.C. UCC clergy and congregants joined the National Council of Churches' ACT to End Racism event on Wednesday, April 4, to launch a movement to dismantle racism in America. UCC General Minister and President the Rev. 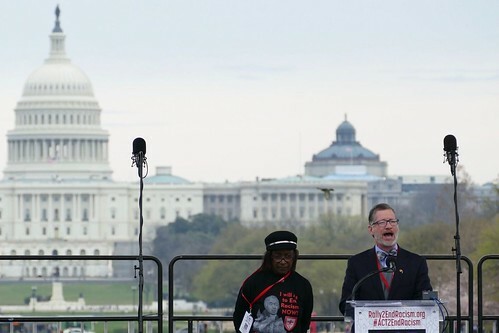 John Dorhauer, one of several speakers who addressed the attendees from the stage on the National Mall, called on faith groups to galvanize their collective power to end racism now. "Dr. King died with the hope that his children and grandchildren would one day know an America indifferent to their race. Fifty years later we are forced to admit that as painful as was the silencing of his voice, the greater pain today is the re-instantiation and resurgence of the racism he gave his life to eradicate," Dorhauer said. "Let our time together today not be about retrieving a memory, but rekindling a hope." "Racism isn't sad, racism is sin," said the Rev. Julian DeShazier, senior pastor of University Church in Chicago, and hip-hop artist known as J.Kwest. He told the crowd that people of faith have a key role to play in ending systemic racism, and it's something they need to fight for every day. "The work has been done before us, but now finishing the work begins with us, in our hearts, in our minds, in our spirits. It requires awareness, alertness, to wake up, to stay woke, to pray woke and to work woke." A number of religious leaders and activists, artists and actors took part in the interfaith gathering – participating in a wake-up call, and what's seen as a starting point for a multi-year interfaith effort to address and eradicate racism from U.S. society and bring the country together. The NCC has outlined several strategies going forward, with congregations being asked to confront racism and white privilege in church life and practices. The ecumenical organization of 38 religious denominations also plans to address systemic racism in areas of environmental justice, the job market, the criminal justice system, in education, and in immigration. The United Church of Christ is already issuing a call to action, launching a restorative justice curriculum, 'Sacred Conversations to End Racism' (SC2ER) to give churches additional tools and resources to move people beyond anti-racism conversations to active engagement. "The United Church of Christ remains committed to being an anti-racist church," said the Rev. Velda Love, UCC Minister of Racial Justice and curator of this new resource. "SC2ER seeks to restore humanity, eliminate myths and stereotypes, and engage in deep truth telling about the construction of whiteness and white supremacy." Before the rally, advocates gathered early morning vigil at the Martin Luther King Jr. Memorial. Then, in a silent prayer walk from the King Memorial to the National Mall, UCC members joined Baptists, Catholics, Hindus, Methodists, Muslims, Orthodox Christians, Reform Jews, and Sikhs along the mile-long route. "This event was meant to galvanize a movement and call a nation to heal," Dorhauer said. "The words alone, while deeply moving, will ring hollow if those gathered cannot make the kind of commitments that change the hearts of white Americans and end not only racism, but the desire to see race as a barrier." Bookmark the Sacred Conversations to End Racism website. Learn more about the ACT Now to End Racism movement.